This category contains 12 files documenting oval track race meets that did not count toward the AAA national track racing championship that year. Barney Oldfield, Louis Chevrolet, Webb Jay and Earl Kiser were among the top driving stars of the day. Oldfield drove his Peerless Green Dragon, Chevrolet drove a Fiat, Kiser was on the Winton Bullet II and Jay had the unique “Whistling Billy” steam engine racer manufactured by the White Sewing Machine Company, which still operates today. This item is from Horseless Age and is a "pit pass" of sorts, offering brief mentions of various events and plans. One item highlight's Pope-Toledo driver Alonzo (A.C.) Webb's victory over Barney Oldfield and Earl Kiser at St. Louis. This article ran in one of the major automobile trade papers in August 1905. Earlier that month at the Glenville horse track near Cleveland Winton Motor Carriage Company driver Earl Kiser was severely injured while drive the team's Bullet II machine. Doctors amputated one of his legs and Kiser decided he could no longer function effectively as a race driver and retired from the sport. His fierce rival and friend Barney Oldfield joined forces with Carl Fisher to organize a race in Dayton Ohio to benefit their injured comrade. The event was conducted August 26, 1905. This Motor Age article is an interesting and somewhat colorful account of a small race meet at the Delmar track in St. Louis, Missouri. The meet was the brainchild of Ernie Moross, who spent several years as Barney Oldfield's manager and later became director of contests at the Indianapolis Motor Speedway in 1909. The meet was conducted May 7, 1905 after several days of heavy rains, which made for an extremely muddy track. This package contains two articles concerning a two day race meet at Columbus, Ohio, July 3 & 4, 1905. The feature event was the Columbus Motor Derby, which featured three cars racing in three heats. Barney Oldfield met his nemisis Earl Kiser in the final. Kiser's Winton Bullet II defeated Oldfield on his Green Dragon. Oldfield had driven the Bullet for much of the 1903 and 1904 seasons. There was also a 24 hour event, but no records were set and it clearly was secondary to the Oldfield - Kiser match race in the promoter's mind. This is a package of two articles on a June 2 & 3, 1905 race meet on the Milwaukee mile. 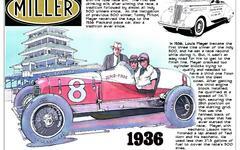 The big attraction was the attendance of Barney Oldfield, America's star of auto racing at the time. The first article appeared in Motor Age, the second in Horseless Age. This is a fine package of articles on the May 21, 1905, race meet at Morris Park, New York. The track was billed as "the world's only track devoted to automobile racing." This wasn't entirely true. The track had lost a ton of revenue when the bulk of horse racing had gone to the newly constructed Belmont Track, also in New York. Latching on to the burgeoning interest in automobiles, Morris Park tried to reinvent itself as an automobile speedway. This May 1905 article from Motor Age covers preparations for the first race of the American auto racing season at Morris Park as well as preparations for the world's biggest auto race of the year, the James Gordon Bennett Cup held in France. The Morris Park track was a horse track dislodged from prominence in that sport by the arrival of the new Belmont facility. Morris Park tried to reinvent itself as the world's first track exclusively designed for auto racing. The Bennett Cup was an invitational to all car manufacturing nations limiting each country to three entries. This Motor Age article reports on a non-championship race staged August 7 & 8, 1905 at Grosse Point, Michigan. Overshadowing the competition was an accident to crowd favorite Barney Oldfield when his Peerless Green Dragon crashed through a fence, destroyed itself against a tree and threw the driver the air. This article from the May 11, 1905 edition of Motor Age reports on the events at an early season race meet on May 6 at the Brighton Beach track in New Jersey. Stars of this meet were J. Walter Christie in one of his innovative front wheel drive "freak" racers, Guy Vaughn and Charles Wridgeway.